Daylight Saving Time – often referred to as "Summer Time", "DST" or "Daylight Savings Time" – is a way of making better use of the daylight in the evenings by setting the clocks forward one hour during the longer days of summer, and back again in the fall. 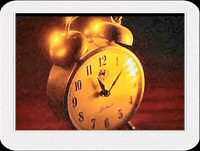 Daylight Saving Time begins for most of the United States at 2 a.m. on the second Sunday of March. Time reverts to standard time at 2 a.m. on the first Sunday of November. In the U.S., each time zone switches at a different time. Change your Fire Alarm batteries! !